1 LP - $15, plus $3 per each additional LP up to 8 LP's in total, all above is $15 per 4-5 LP's. 1 45 - $6, plus $2 per each additional 45 to the parcel. 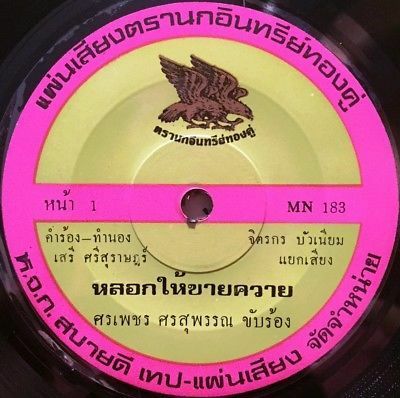 Monster Thai psych funk breaks 45! Please note that I'll be listing Asian stuff on daily basis during this and next month, so check my shop during this time not to miss any heaters! I HAVE MANY POSITIVE FEEDBACKS FROM MY PREVIOUS CUSTOMERS ALL AROUND THE WORLD, SO BID WITH CONFIDENCE. PLEASE, DO NOT PAY ME UNTIL I SENT INVOICE TO YOU! ALL PAYMENTS MUST BE MADE WITHIN 3 DAYS AFTER AUCTION END. All records are safely packed in cardboard mailers with 2 layers of cardboard from each side. If you have any questions, please, do not hesitate to ask me!!!! NM : Looks unplayed, or very well maintained, as close to perfect as it gets. Possibly some very light sleeve marks or an extremely minor flaw that will in no way affect play. EX : Very close to being perfect, shows some signs of play, handling marks, one or two very light marks expected, but a record that has been handled with care. VG+ : A shiny copy with a few noticeable flaws, might have a lot or a few light marks, or one big mark/scratch that doesn't affect play. Always plays great, with one or two normal pops/clicks/etc. and minimal distraction. VG : Considerably marked/scratched up copy, but plays with no serious flaws. A few clicks or pops or light noise should be expected, but nothing seriously affecting play. A very suitable copy for working DJs. VG- : rough copy that will play with some clicks, pops, and light noise, a copy to fill the a gap until a better one comes along. G : very rough, loss of shine. I only list G records that are extremely rare, or play well for the condition. NM : Looks almost like new. Well maintained. EX : Almost flawless, a few light corner dings away from perfect. VG++ : A few minor flaws, like small writing or light ringwear. VG+ : some splits or light damage to art work, ringwear, some writing on front or back cover. VG : somewhere between VG+ and VG-. A passable cover, until a better one comes along. VG- : split spines or seams, and/or damage that affects the art work or track listing. Lots of writing, or small bit of cover damaged. G : tattered, falling apart, rough.